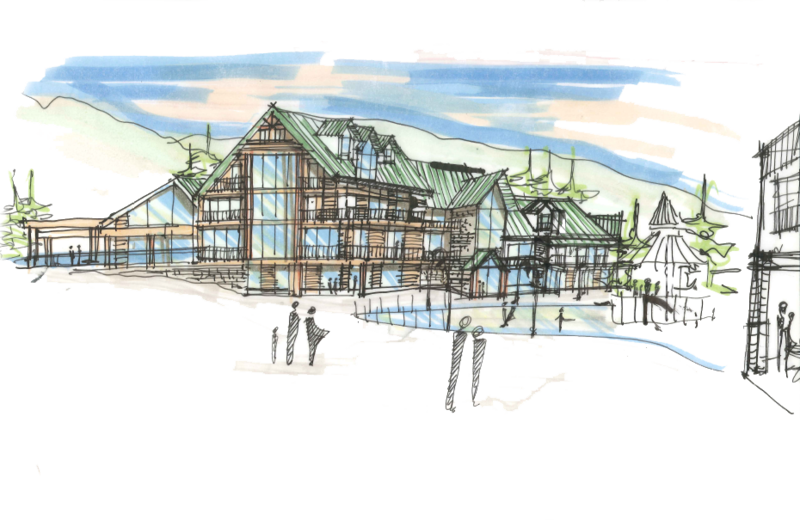 One of the most exciting parts of being involved in Valemount Glacier Destination Resorts has been seeing how community stakeholders have initiated and shaped this project. Widespread consultation is a bare minimum for projects of this scope and scale, but the process that has taken place over the last four years has been deeper and wider than any we’ve seen in recent times. Here is an insider’s view of how local groups have had influence on the resort project. The Valemount Ski Society, the Valemount Community Forest, the Village of Valemount, Simpcw First Nation, and the Regional District of Fraser Fort George are all major stakeholders in this project. Let’s take a look at how these players made their mark. This project was initially pitched as a mountain style ski hill on Mount Albreda in early 2011. It was the brain child of local man Joseph Nusse. Nusse knew that Valemount’s riches were in its rugged mountain landscape and deep powder snow. He brought his idea for a big mountain ski development to the Village of Valemount. Valemount mayor Bob Smith, Village Administrator Tom Dall and Economic Development Officer Silvio Gislimberti reviewed the Mount Albreda proposal and made a call to one of BCs best known players in the ski industry. Oberto Oberti, who has been involved in just about every transformational ski development project in the province, would eventually be convinced to play a role in the project. When he did, his first consultation was with the Simpcw First Nation. Any and all of these parties might have been treated as groups who needed to be consulted. Boxes to be checked. But this was different. As it turned out, the Simpcw weren’t new to the ski industry. They were partners in a heli skiing joint venture in Albreda. They consulted with their partner and chose to support a project even closer to Valemount in the Cariboo Mountain Range. Looking through the master plan, one can see that the Simpcw’s involvement is substantial. Opportunities around clean on site power generation not only play to their strengths but offer meaningful benefit to the project and to the wider community. First Nations openness to a development near Valemount excited local people. Their input steered the project towards the eastern approaches of the Mount Sir Wilfred Laurier massif where a ski development had been considered years before. For those of us imagining what a close by mountain resort might mean for revitalization of our community, moving this early concept from Mount Albreda (some 30 km south of the village) to Valemount’s doorstep was a very positive step. In 1995 American architect Jack Johnson produced a report about the area and in 1998 Valemount’s economic development office had its own look at the possibility of a community ski hill in that location. Needless to say, the community had considered the idea and it had some studies on the shelf. However wasteful those studies may have seemed at the time, this preparation was not in vain, because at the very least government had made a notation on that site. They had flagged Mount Trudeau as future ski hill. When things got rolling, there were concerns in the community that had been raised by a previous attempt to bring a resort to Valemount (Canoe Mountain Gondola circa 2003). So the community organized itself into the Valemount Ski Society to represent those concerns directly to the developer. When a group of international visitors came calling to take a look at the proposal, the society put together a petition that would garner half the community’s signatures in about a week. The Regional District of Fraser Fort George had experience in planning for resorts, and after receiving word about this new proposal they were prepared to help out with governance issues and zoning, regardless of whether the resort would end up as an expansion of the Village of Valemount. The proposed area for the resort is inside the Valemount Community Forest. They have been an amazing partner in terms of facilitating access and sharing knowledge and resources and even changing their harvesting plans to aid in road building. No doubt every major project requires a host of players to make it happen, but Valemount Glacier Destination has benefited by a constellation of partners willing to help. There hasn’t been a single project that has united so many players in the region. Now the project is in the final stages of approval. And it is no wonder why it continues to enjoy broad support from its partners. For folks with an interest in regional economic development, they’ll note that this project has those characteristics required for success: local support and input, a cogent plan, an experienced developer, experienced financiers, broad support, and the cooperation of First Nations. There is an object lesson here for future developers. Any and all of these parties might have been treated as groups who needed to be consulted. Boxes to be checked. But this was different. Every party at the table has shaped the project in a meaningful way. Consultation is an opportunity to share and grow, to develop essential partnerships that can make a project happen… or in this case, make a project great.